A sweet collectible no Simpsons fan should be without. You're looking at an 8GB iPod Touch (previous generation) featuring the logo for Electronic Arts' smash hit mobile and tablet game, The Simpsons: Tapped Out. Suffice to say, it's extremely rare and quite the collectible for fans of not only the game, but also The Simpsons in general. That said, it's time to give this baby away. That's right. EA Mobile graciously donated this sweet-looking Touch for the contest. To enter, leave a comment briefly describing your favorite Simpsons character. The contest will run until next Thursday, November 8, and we'll randomly pull the winner shortly thereafter. On that note, this contest is open to everyone, both international and domestic. Of course, you must have a valid address. 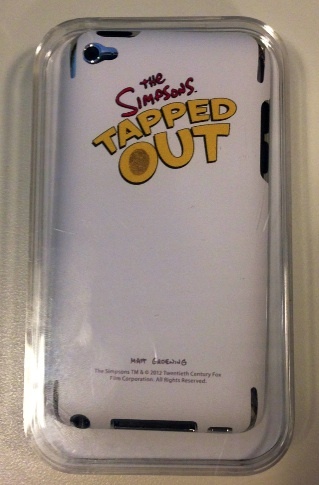 Otherwise, naturally, we won't be able to send this Simpsons iPod Touch your way. Please make sure you can receive messages on Facebook, and check them regularly the day after this contest, November 9. This is how we'll get in touch with the winner. With this in mind, big thanks to EA Mobile for sponsoring this giveaway. In the meantime, check out these Simpsons features, and be sure to download the game.